Boss Justin Edinburgh believes new signing George Smith will provide Dave Buchanan with genuine competition for a place in the Cobblers first team next season. The 20-year-old has been snapped up for an undisclosed fee from Vanarama National League side Gateshead, and has put pen to paper on a two-year deal at Sixfields. Edinburgh has spoken of the need for there to be proper competition for every position in the team, as he felt that wasn’t the case last season. Buchanan started all but one of the Cobblers’ 54 matches last term, with Raheem Hanley failing to challenge the former Preston North End man. Hanley has been transfer-listed by Edinburgh and has made his move for Smith, who has played regularly at Sky Bet League One level in the past with his first club Barnsley. “For a young player he has a good deal of experience under his belt already,” said the Cobblers boss. “He has a lot of ability, he is a talented boy and he has a fantastic attitude. Smith came through the academy ranks at his hometown club Barnsley, and in two seasons as a teenager at Oakwell he made 36 starts and eight substitute appearances. 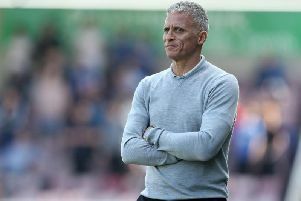 He was initially offered a new deal in the summer of 2016 to extend his stay with the south Yorkshire club, but that offer was withdrawn after they were promoted to the Championship in the play-offs, and he was captured by Gateshead. Smith was a regular in Neil Aspin’s team last season and was offered a contract to stay at the International Stadium, but he has been handed the chance to get back into the Football League by the Cobblers. “George has performed well in league one before,” said Edinburgh. “We think he is a very good player with a bright future ahead of him.